We visited this park on December 2, 2013, and stayed for 2 day(s). I would have happily stayed at Yogi Bear Jellystone Park in Elberta AL for a couple of weeks. This little gem of a park was priced right for Passport America members. We paid $35 for two nights. It’s rustic, but wide roads and wide sites made for easy navigation of a big rig. All sites are fully wooded, but there’s no undergrowth. If the park were full, we might have desired more privacy, but at far less than half-capacity due to the season, we had plenty of space and it felt private enough. 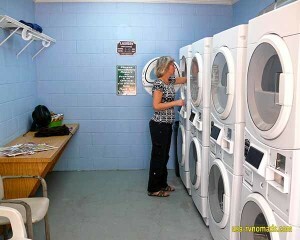 We camped adjacent the laundry, which was clean and well-maintained. There was a pool, a playground, and a clubhouse, but none were in use due to the season. The staff here was exceptionally friendly.